The financial projections template provides each of the three main financial statements including the cash flow statement. Understanding cash flow statements is one of the most important areas an entrepreneur needs to get to grips with when starting a business. Startup businesses by their nature tend to experience cash flow problems. As the business seeks to expand, additional cash is needed to fund the growth in working capital and investment, this problem is further compounded by the lack of available finance facilities for a startup operation. The cash flow statement looks complicated but is in fact relatively straightforward to analyze. By way of example the cash flow statement of Apple Inc. for the year ended 24 September, 2016 has been used and is shown below. For ease of reference a PDF copy of the cash flow statement is available here. At first sight the cash flow statement contains a lot of detail, but a closer inspection reveals a similar format to that shown in our financial projections template. The statement shows the three types of cash flows. These cash flows are more fully discussed in our cash flow forecast tutorial. 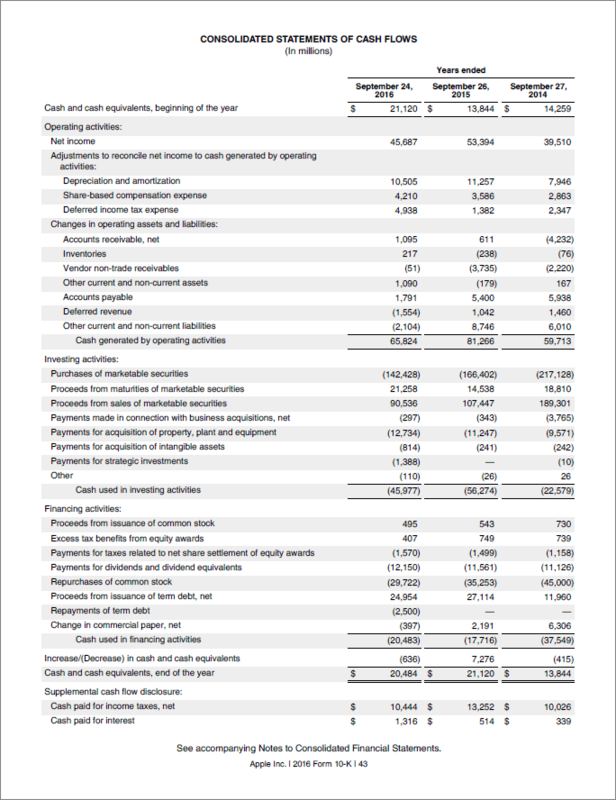 The total of these three cash flows shown in the Apple Inc. cash flow as ‘Increase (decrease) in cash’, represents the net cash flow for the year. The net cash flow is then simply added to the beginning cash balance at the start of the year to provide the cash balance at the end of the year. This simple structure is shown in outline below. The cash flow statement simply shows that in 2016, Apple Inc began the year with a cash balance of 21,120, had net cash outflow (negative) of 636 and ended the year with cash balances of 20,484. This simplified format shows what at first appears to be a complicated cash flow does in fact have a basic underlying structure similar to that provided by the cash flow forecast included in the financial projections template. Having established that there is a simple basic underlying structure to all cash flows no matter how complicated they first appear, the next step to understanding cash flow statements is to look at the detail contained in each of the three types of cash flow. The cash provided by operations relates to cash the business generates through its normal day to day trading activities. The section starts with the net income of the business which is taken from the income statement. Net income represents whats left of the revenue of the business after deducting all expenses. Of course the expenses include such items as depreciation and share based compensation which are accounting entries and do not involve the movement of cash. To allow for this these items are added back in the cash flow statement. Likewise net income has been arrived at on an accruals basis. For example, revenue has been adjusted to allow for revenue earned but not yet received (accounts receivable). Expenses have been adjusted for goods purchased but not used at the end of the year (inventory), and costs used but not yet paid for at the year end (accounts payable). Again, in order to allow for these accounting adjustments, the net income is amended in the cash flow statement for changes in working capital during the year. These adjustments effectively convert the accruals based net income to a cash basis. The cash provided by operations in Apple Inc.’s cash flow statement summarized above, shows the following key points. Depreciation (10,505) and share-based compensation (4,210, which are non-cash items, have been added back to net income as they were originally deducted as expenses in arriving at net income. Amounts due to the business (accounts receivable) decreased during the year by 1,095, this decreased working capital and increased the cash available to the business. Inventory decreased during the year by 217, this decreased working capital and increased cash flow available. Amounts owed by the business (accounts payable) increased during the year by 1,791, this decreased working capital and increased the cash available to the business. In the case of Apple inc. as it is an established company and has surplus cash, the main activity in the investing activities section is the buying (and selling) of marketable securities. For a startup business the important activity in this section is normally the purchase of property plant and equipment. The cash used for investing activities in the Apple’s cash flow statement summarized above shows the following key points. The final section of the cash flow statement is cash used by financing activities. This section relates to amounts of cash received from equity and debt financing less cash used to fund dividend payments and interest on debt. The cash used for financing activities in the Apple’s cash flow statement summarized above shows the following key points. Obviously the cash flow statements of an established company such as Apple inc. will contain much more detail than that of a startup business due to the varying activities such as investments in marketable securities and repurchasing of stock that it undertakes. However, despite this, all cash flow statements follow a similar basic structure. They will always show that the business started with a given cash balance, had cash flow movements during the year from operating, investing, and financing activities, and ended with a cash balance which is the sum of the starting cash balance and this net cash flow movement. The cash flow statements from our financial projections template show a similar basic structure, and can be analysed as follows. Suppose a business has used the financial projections template to generate the cash flow statements for five years shown below. If we consider as an example year 2 of the cash flow statement, we see the following. The cash flow statement can be analyzed and read section by section as follows. The main points in the analysis are as follows. Net income generated by trading operations was 4,802, the business has made a small profit. Depreciation of 14,000 which is a non-cash item, has been added back to net income as it was originally deducted as an expense in arriving at net income. As the business is a growing startup, trade on credit terms with customers increases resulting in increased amounts owed to the business (accounts receivable) of 4,315. As this cash has not been received it increases working capital and decreases (negative) the cash available to the business. Likewise as the business grows it’s inventory grows. During the year inventory increased by 3,884 resulting in an increase in working capital and decrease (negative) in cash flow available. Amounts owed by the business (accounts payable) increased during the year by 2,589. Since this increase results in a decrease in working capital it increases the cash available to the business. The business is effectively using supplier credit to fund it’s operations and therefore retains the cash. Likewise amounts owed for other liabilities increased during the year by 948. This increase again results in a decrease in working capital and an increase in cash available to the business. This section of the cash flow statement simple states that the business invested 50,000 in the purchase of long term assets such as property, plant, and equipment. As startup businesses are normally investing in new assets, the cash flow from investing activities is normally a cash outflow (negative). Finally the cash flows from financing activities section shows the following. The business raised debt finance (loans etc.) and received 46,000 from a lender. Additional shares were issued and the business received a further 5,000 from investors. The business made debt repayments on it’s long term debt amounting to 15,830, this resulted in a cash outflow (negative) for the business. Again, as this is a startup business they are normally in the process of raising debt and equity finance and the cash flow from financing activities is normally a cash inflow (positive). When these three cash flows are added together they result in a net cash outflow (negative) to the business of 690. When this net cash flow is added to the beginning cash balance at the start of the year of 1,846 this results in an ending cash balance of 1,156. These cash balances would be shown on the beginning (year 1) and ending (year 2) balance sheets respectively. It is important that a business has a basic understanding of cash flow statements, they clearly explain how cash is coming into the business and more importantly how it is going out of the business. 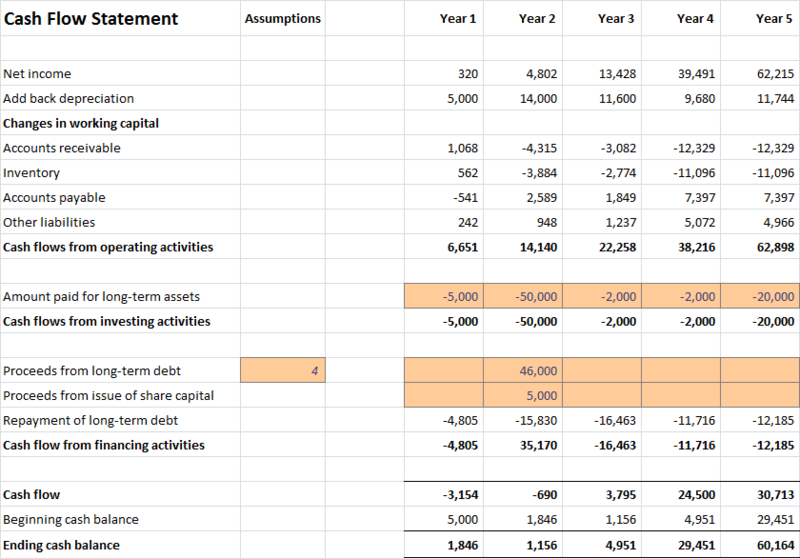 It can be seen that the cash flow statement explains how the cash balance at the start of the year (shown in the beginning balance sheet) reconciles to the cash balance at the end of the year (shown in the ending balance sheet). The difference between the two balances is the net cash flow movement for the year analyzed into operating, investing, and financing cash flows. By understanding a cash flow statement the business is able to answer questions such as whether the basic trading operations are generating cash, whether accounts receivable and inventory are getting too high and absorbing too much cash as the business grows. It enables capital investment decisions on property, plant and equipment to be made, and allows the business to plan how much cash it needs to raise from debt and equity finance to support the operation and avoid future cash flow problems.